Glowering amid dark rumours and terrible stories of desperate adventure, death, betrayal and glimmering treasures squat the unutterably ancient halls of Gloamhold. This crumbling, benighted, haunted dungeon complex of unknown, but undeniably vast, extent is buried deep within the grim and brooding spray-drenched headland of the Mottled Spire. It is a place of legends, madness and death. Within this towering, wave-lashed shard of limestone lies the labyrinthine passageways and chambers of Gloamhold’s outer reaches and, beyond them, the benighted precincts and canals of the legend-shrouded Twilight City. Check out my design notes, and delve into the plotting and scheming behind Gloamhold’s design. Keep up to date with the events in my Adventures in Shadow campaign set in Gloamhold and its environs. The benighted, shadowed Gloamhold is an immense megadungeon of unknown extent. As sea fog rolled in, the party took a quick look at Devil’s Cove and discovered steep, vertiginous cliffs glowering over a narrow stony beach. While searching for tracks, Johann realised the vegetation in the area was strangely stunted and mis-coloured—in much the same way as the seaweed and weeds choking the ruins of Greystone. After their recent trials, the party rested for a week, Several of the heroes wanted to reflect upon their experiences and others had some shopping to do (or simply wanted to get to know Languard a little better). An isolated place, perched upon an inhospitable coast at the head of a muddy coastal path, Coldwater is not an easy, or pleasant, place to visit. The village huddles at the mouth of a steep-sided valley leading down to the sea. With Toliyrath’s funeral finally out of the way, the heroes minds’ turned to Jeremiah and his ordeal in Luestiss’s watery clutches. The party resolved to rescue their friend and to retrieve the darkwood figurehead she had kept against’s Jeremiah’s “attentions”. Laying their plans in the common room off the Orc’s Head the party sent word to Taneli that they would depart tomorrow on the morning tide. We sadly had the first death in my Adventures in Shadow campaign recently (in 017: Death in the Darkness). Brave Toliyrath—wizard about town and one-time rope merchant—was crushed and burnt to death by a crystal ooze in the sunken tunnels below the ruined village of Greystone. His death was entirely avoidable and pointless. Gathering themselves, the party prepared to open the false bottom on the double sarcophagus. With the help of some of his friends, Thangrimm levered the bottom up to reveal a double tomb. Within lay two mummified humanoids locked in an eternal embrace as if sleeping. In a large dungeon or megadungeon (such as Gloamhold) you (the GM) can never be perfectly prepared. No one has the time—or I suspect the patience—to prepare hundreds of different encounter areas. 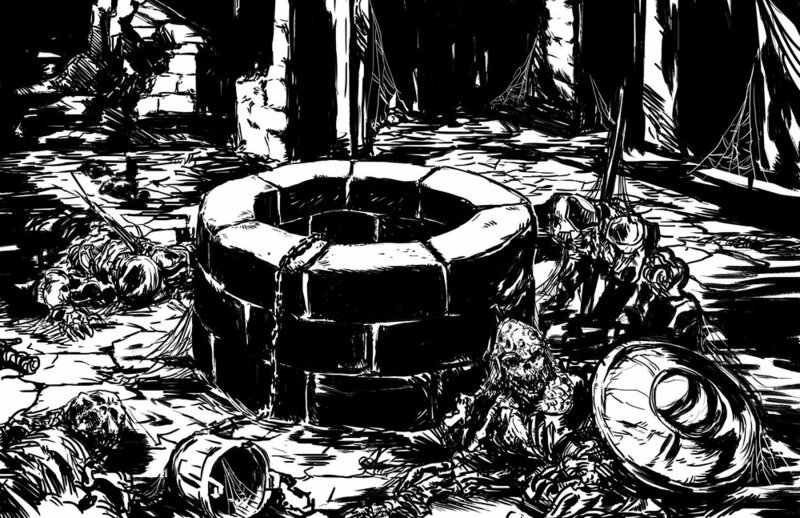 Having destroyed the skeletal inhabitants of the first crypt and comprehensively looted the area, the heroes’ appetite for more loot drove them deeper into the crypt. Taking the left-hand tunnel they cautiously advanced along a staggered passageway of strange design. Stocking Gloamhold: How Much is too Much? In my continuing design of Gloamhold I’ve begun to think deeply about monster placement. On the face of it, this isn’t the massive of a deal—just stuff the dungeon full of monsters and treasure, and unleash a pack of blood-thirsty, treasure-seekers into the dungeon! A busy, prosperous village, Wellswood is justly famed for the warm welcome travellers find in the village’s taverns and inns and for its most striking feature: Lake Thraren—a subterranean lake lying deep below the village’s foundations. The villagers catch the exotic fish swarming in its deep, cold waters and on its shore stands the fortress home of the dwarf clan of Erdikr. Here long before humans colonised the land above, these secretive dwarves serve Lord Issakainen, maintaining the village’s many wells, but let none enter their lightless home.